I bought this workout DVD partially for the title alone. 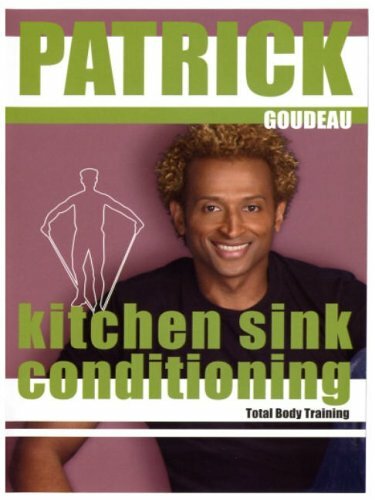 Kitchen Sink Conditioning. What an odd and somewhat humorous title! And since it is by Patrick Goudeau, it deserved further evaluation. I did more research and, just as it sounds, it is based on the idiom “everything but the kitchen sink”–as in, this workout uses a ton of equipment. So warning–do not buy unless you look around your workout area and find you seem to have it all. Because Patrick is not exaggerating with that title–he uses everything short of a barbell (but in the future, I will be including a barbell–but more on that later). I happen to own a ton of equipment myself and from watching a clip of this workout it appeared I owned everything he uses, so I decided to give this workout a try. Surprisingly, I have a lot to say about this workout. First, I really liked it. It was a lot of fun. It is the perfect workout for someone who wants a total body workout with lot of variety because that is exactly what you get with this workout–your entire body worked head to toe with tons of variety. In fact, he even gives you two warm ups to choose from! In his introduction he states that this is an advanced workout. But I disagree. It is one of his early workouts (2004), so perhaps at the time he considered this advanced. I am sure he does not any longer. Hard Work Conditioning 2, Extreme Calorie Burn, Lean Hot Body and Body Weight Blast all put this workout to shame as far as level of difficulty and intensity. Kitchen Sink is intermediate, but depending on the “weight” of the equipment you use, it could be a very low intermediate or a high intermediate workout. In addition, he does show modifications for some of the exercises to make it even more doable. Patrick is always a very fun and likable presence in his workouts. He seems to be enjoying himself here and laughs a lot with his crew members. His personality frequently adds a lot to his workouts and in this one it seems to make the time fly by even quicker. Before we go any further, what equipment is necessary for this workout? A step at 8 inches, dumbbells, a body bar, resistance tubing, a medicine ball and a stability ball. However, I found after doing it once, that in the future it will be necessary to have more than one level of some of the equipment. Luckily for me, I do have more than one of just about everything. It looks like they are using a 4 pound medicine ball; I have one of those but I also have an 8 pound medicine ball–I used both in this workout. They each have different color resistance tubing. I only pulled out my blue (medium) tubing, but in the future I will also have my green (heavier) available for back work. They all had different lengths and weights of body bars. I had my 15 pound and my 9 pound available and I used them both, but in the future, for some of the exercises, I will also use a barbell with plates on it because even the 15 pound body bar wasn’t heavy enough. And finally, dumbbells. They all had different color dumbbells but they all looked like they were probably 5 pound dumbbells. I had 8 pounds and 12 pounds available but in the future I will also have 15s and 20s. With these adjustments, I think this will be a high intermediate workout. Now, because I will not be coming back to this workout right away (though I definitely will–as I mentioned, it was fun! I really enjoyed it and got a good workout) I am going to be adding some things to the breakdown I don’t usually include, but this is for my own benefit so when I return to it I don’t have to do another dry run to get things right. I will know exactly what weight/body bar/medicine ball/tube to use for each exercise. Oddly, you cannot play this workout from beginning to end. It is broken down into 4 sections (Warm Up 1, Warm Up 2, Total Body Training and Abs & Stretch) and you have to chose the order in which you do them. Which is odd, because the order seems obvious to me. The only real choice is which warm up to use. The first time I did it, I did both warm ups, but in the future I will do the medicine ball warm up because I liked it best. This is a kind of cardio + strength workout, but mostly strength. The warm ups contain cardio and the first leg segment alternates strength with cardio blasts. But after that there really isn’t much of a cardio factor except that it is fairly fast paced. If you do Warm up #1 + Total Body Conditioning + Abs & Stretch, it is 66 minutes long. If you do Warm up #2 + Total Body Conditioning + Abs & Stretch it is 65:30 minutes long. Warm up #1 contains the 3 minute introduction. After the introduction is complete, the warm up itself is 5:30 minutes long and uses the medicine ball. I used my 4 pound medicine ball for the warm up. Warm up 1 includes squats in which you touch the ball to the floor at the bottom of the move and bring overhead at the top, rotate the ball side to side, then woodchop the ball. Set the ball beside the step and do 8 push ups with hands on step. Repeat this sequence 3 times. Get into static plie/sumo squat and alternate reaching hands overhead. It ends with some stretches. Warm up # 2 is 5 minutes long, uses no equipment and is easier/lower intensity than Warm up #1. Step touch side-to-side, 1-2-3 hold jog, fast shallow lunge backs on same leg (don’t alternate). Next you will do a step down into plank with hands on the step–do this 4 times and hold in plank on the 4th. Do 4 push ups. Repeat everything but do the lunges on the other leg. You’ll finish with some stretches. Total Body Conditioning is 45 minutes long. Legs: Grab your body bar. I grabbed my 15 pound body bar but in the future I will have a barbell loaded up with probably 40 pounds to start with. 1. Traveling squats (2 to the right and 2 to the left). 2. (Still using body bar) Squat, tap one foot in while still in squat then stand. 3. Put down body bar. Cardio interval: tap toes on top of step for about 30 seconds, do some jumping jacks; repeat. 4. Grab your dumbbells. I grabbed 8 pounds the first time, but in the future I will grab 12s. Start step touching side-to-side, staying low. Turn your step into a side jump with 3 taps, change to just 1 tap, then just jumping (like skaters). 5. (Still holding dumbbells) One leg squats (non-working leg is on step, but no weight on it). 6. (still holding dumbbells) Stand on one leg on step with other leg raised and bent in front of you; tap the floor with raised leg (barely touching the floor when you tap so all the weight is on other leg); start taking tapping leg further back (engaging more glutes). 7. (Put dumbbells down) Cardio interval: run up and down off the step for 30 seconds (do this twice, changing the lead leg for the second time). 8. Grab medicine ball–I used my 8 pound ball. Plie squat setting ball on ground then straighten legs reaching arms overhead then plie squat, picking the ball up. Chest: Grab stability ball and dumbbells (I grabbed 12 pounds, but I will use 20 pounds in the future). 1. Chest press on stability ball. 2. Chest flys on stability ball. 3. (Put down dumbbells) Get into push up position with hands on ground and shins/knees on stability ball; do a push up, then roll/pull ball in with legs. 4. (Set stability ball aside) Grab body bar and lay on step, feet on ground; raise hips up off step. Do two overhead presses with body bar then stretch straight arms (still holding body bar) over head then back up (I used the 15 pound body bar for this, but in the future I will use a barbell and start with at least 25 pounds on it and probably increase). 5. (Set body bat aside) Sit up on step, bring knees in toward chest leaning back slightly; hold arms out in a T and bring knees in in a pulsing movement (working abs). Back: Grab your tubing (I used the blue/medium tubing but in the future I will use the green (heavier) tubing). 1. Hold handles of tubing then wrap it around hands so that there is only 6-12 inches of tubing visible. Put visible tubing under one foot then lift that same foot up and straighten leg in front of you (so you are standing one one leg); do back rows. Now, the modification (which I used) is to put foot/heel on the step and row that way (takes the balance aspect out of it). 2. Keep tube wrapped around your hand in the same way as last exercise; bow and arrow move. 3. (Set tube aside) Grab stability ball and dumbbells (I only used 8 pounds for this but in the future I will use 12 pounds for the first part of the exercise and then drop to 8s for the second part). Lean on ball and extend feet out straight behind you with chest raised; grab dumbbells which should be on the floor in front of the ball. Alternate arm rows in this position. The dumbbell that isn’t rowing will be resting on the floor. Next, you change to rowing both arms at the same time and the dumbbells never rest on the floor. 4. (Set stability ball aside) Stand up with dumbbells (I stuck with the 8 pounds for this one and it was appropriate). Hold arms bent at side, elbows at side, dumbbells out in T. Squeeze elbows behind you. Triceps: Grab tubing (I used blue/medium tubing and it was appropriate). 1. Double arm overhead tricep press/French press with tubing. 2. (Set tubing aside) Grab body bar (I used the 9 pound body bar for this one and it was appropriate). Hold it in one hand behind head/back; do one arm tricep press/French press. 3. Yoga-type move; get into down dog with hands on step and under shoulders, go to plank then lower body so you are hovering close to step and hold; then push up to plank then back to down dog (hands will be close together, elbows close to sides, so it is basically a tricep push up). Biceps: Grab body bar and tubing (I used 15 pound body bar and blue/medium tubing; both were appropriate). 1. Put handles of tubing around ends of body bar, step on tubing and hold body bar like a barbell; do bicep curls. 2. (Set body bar and tubing aside) Grab dumbbells (I grabbed 12 pounds) for wide bicep curls. Hold arms out, elbows away from sides; curl halfway up and halfway down. 3. Keep dumbbells (I kept the 12s but in the future I will use 15s) and get into lunge position; you will hold this static lunge position. Lunge down then do a bicep curl; keep alternating. Next just do static lunges. End by holding the lunge in the lowest position while doing bicep curls. Legs: No equipment to start. 1. Stand straight with arms held like a genie in front of you; lift and lower leg to side. 2. Grab medicine ball (I used 8 pound ball for this) and do side lateral lunges, setting the ball on the ground for one lunge then picking it up for the next. 3. Keep medicine ball. Curtsey lunge, tapping ball to ground, then come up and lift leg to side, reaching ball overhead. 4. Set medicine ball aside and grab body bar (I grabbed my 15 pound bar but in the future I will use a barbell with 20-25 pounds on it to start with); get into lunge with bar between legs and holding it at either end; staying in this position, lunge up and down. 5. Bring the body bar in front of you and come up into what Patrick calls an arabesque, raising one leg behind you (balance move); lift and lower leg. Shoulders: Grab dumbbells (I used 8 pounds). 1. Side lateral raise, bring arms to front then lower to front of body then reverse: front raise to side lateral then bring dumbbells down to sides. 2. Sit on step (I changed to 12 pound dumbbells here). Overhead shoulder press. Add alternating knee raises. Add raising both legs while leaning back slightly. 3. Set dumbbells aside and grab body bar (I started with 15 pound body bar but changed to the 9 pound body bar for the second part of the exercise). Front raise. Add squat with front raise (this is where I dropped to 9 pound bar). Abs & Stretch is 15:30 minutes long (Abs are 10 minutes and stretch is 5:30). 1. Lay back on step holding medicine ball (I used 8 pound ball), legs straight to ceiling; press medicine ball towards feet. 2. Push medicine ball overhead the same time you press legs out straight (so body is in straight line), then pull ball and knees in. 3. Sit up on step, feet off ground and upper body leaned back; toss medicine ball from hand to hand (hands are at sides of body). 4. Set medicine ball aside but stay on step and lay back; do bicycles. 5. Grab edge of step behind head; lift legs straight to ceiling and scissor them. 6. Sit up on edge of step; keep feet off ground and lean upper body back; lift arms into a T; raise and lower arms overhead. 7. Move to mat and grab stability ball; lay on back with knees bent and rest ball on shins; grab ball and bring overhead then put back on shins. 8. Stretch.